St. Stephen's Day immediately follows Christmas, and the Church rejoices in this first testimony by blood to the fact of the Incarnation. Children love the Acts story about St. Stephen, who for love of God was stoned to death while praying for his enemies. It is also becoming a practice to pray particularly for our enemies, and it is appropriate to remember the persecuted Church throughout the world and all the people who, like Stephen, are being afflicted for their faith. "As the family gathers around the lighted Christmas tree in the evening to eat minced meat pie dessert, the mother or father reads the story of Good King Wenceslaus who "looked out on the Feast of Stephen" and who enjoyed eating his minced meat pie after sharing his meal with a poor peasant family. The story is delightfully told in More Six O'Clock Saints by Joan Windham, and can easily be acted out by the children. 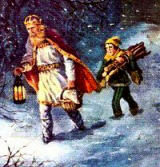 Afterwards all join in singing Christmas carols, especially "Good King Wenceslaus." From Twelve Days of Christmas by Elsa Chaney, Liturgical Press. The story of this saint can be found in the Acts of the Apostles (ch. 6 and 7). His feast was assigned to the day after Christmas because he holds a unique place among all the saints of the New Testament, having been the first martyr for Christ. From early times, St. Stephen was venerated as the patron of horses. This patronage is probably based on the fact that in pre-Christian times horses were sacrificed at the winter solstice among the Germanic nations. Others use the fact that in medieval times 'Twelfth Night' (Christmas to Epiphany) was a time of rest for domestic animals, and horses, as the most useful servants of man, were accorded at the beginning of this fortnight something like a feast day of their own. A poem of the tenth century pictures the saint as owner of a horse and relates how Our Lord miraculously healed the animal of the His beloved disciple. In many rural sections of Europe, horses are still blessed in front of the church on St. Stephen's Day. In past centuries, water and salt, oats and hay were also blessed, to be kept by the farmers and fed to their horses in case of sickness. St. Stephen's Horns from Central Europe (Podkovy) and Roast Suckling Pig (Maialino Arrostito), from Italy are some dishes to be served on this day. From The Catholic Cook Book edited by William Kaufmann, pp. 73-75.